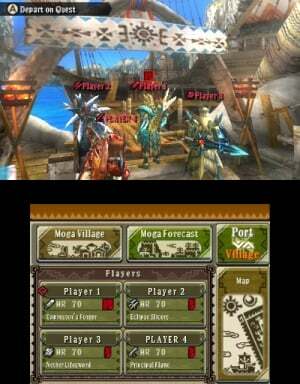 Back when the 3DS handheld was looking for saviours during the Holiday season of 2011, a certain mustachioed plumber was joined in Japan by Monster Hunter 3 G, an expanded version of the popular Wii title Monster Hunter Tri. Its sales were eye-catching and reflective of the fact that handheld Monster Hunter titles are hugely popular in Capcom's homeland, and now it receives a major test in the West with the localisation of Monster Hunter 3 Ultimate. What we have is a technical accomplishment that impresses, and a level of content unprecedented to date on 3DS. 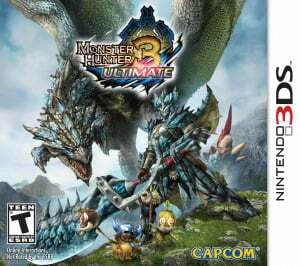 While 12 months separated the two releases in Japan, with the 3DS title coming first, this entry arrives alongside a Wii U contemporary, which you can learn about in greater detail in our Monster Hunter 3 Ultimate review. Most pleasingly it is, in almost all respects, the exact same game. That means an incredible amount of content that, given a player ready for a challenging, grinding and intense level of immersion, will take the potential hours-played tally into three figures. The early running is undoubtedly slow paced, with around five to six hours of learning the ropes and tussling with small, relatively weak monsters. They're important foundations, however, as you learn about gathering resources of various kinds, the equipment needed to do so, and the basic concept of accumulating goods and trading, selling or combining them for the best possible effects. You can also take the chance to try the varied weapon types, with melee weapons of various sizes and speeds, while gunners can also get to grips with the aiming mechanics and controls. It's a steady introduction to the world of Monster Hunter and Moga Village — which you're trying to save from mysterious earthquakes — that is invaluable knowledge when the difficulty steps up, and it most assuredly does, later in the adventure. As the monsters become stronger and more dangerous, this 3DS entry hits its greatest challenge: controls. 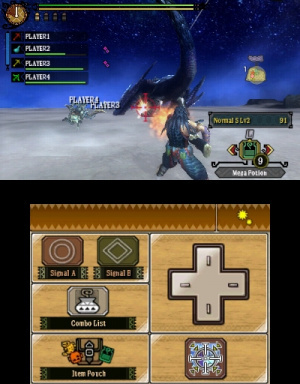 MH Tri, and particularly Ultimate on Wii U, benefited from dual analogue controls, but like the Wii version's optional Classic Controller setup this supports the Circle Pad Pro as well as the upcoming Circle Pad Pro XL. 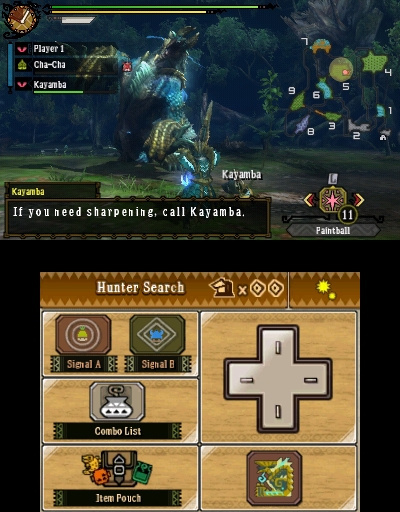 With the standard setup, Capcom has undoubtedly made the best of the options available to it; a lock-on camera redirects the view to the target with a tap of L, and the fully customisable touch screen panel setup is perfectly suited for a virtual D-Pad on the right side, a short stretch of the thumb for some camera control. Both options work well, though underwater sections that demand constant camera control to dictate direction are undoubtedly trickier with the touch screen alternative. Aside from that it's a very strong setup, with the touch screen panel customisation being an excellent addition, giving freedom in terms of the shortcuts you want to access and the option to clear some of the clutter from the top screen. And it is the action on the top screen that steals the show, with the varied lands — incorporating forests, icy tundras, a volcano and more — coming to life in 3D. It's one of the finest uses of the technology to date, with the world and, most importantly, its cast of monsters looking terrific on the handheld. Capcom's team did a solid job of making the effect impressive to see, but also avoided pitfalls of excessive ghosting or discomfort on the eyes. The single player campaign is hugely extensive, with the story mode concluding — after 30 hours or more — by simply opening up a raft of new challenges. There's then Port Tanzia, a separate hub that includes another range of shops and equipment forging experts, with its own single and local multiplayer quests to take on. Following the quest structure of the Moga Village campaign as the means to level up — much preferable to the ranking points grind of Monster Hunter Tri — you simply step up by completing quests once. Conquering them on your own will be much easier with the help of your pint-sized Shakalaka team-mates, Cha-Cha and Kayamba; by necessity this will encourage you to learn your craft in the main campaign, before diving into these tough quests. Local multiplayer is also an option with fellow 3DS owners — everyone needs a copy of the game — or with someone playing the Wii U version. Playing with other handheld gamers is intuitive and flawless to set up, with the game notifying you as soon as another hunter is detected, while joining a home console gamer necessitates the Wii U player taking on the role as host. In both cases it's a lag-free, fun experience that enhances the thrill of the hunt. Unfortunately, the absence of online multiplayer feels like a missed opportunity — unless you utilise a Wii U / Wii LAN adapter and a Wii U app. With some notable 3DS releases featuring solid multiplayer — Heroes of Ruin in particular shows that the tech can support voice chat and reliable online lobby systems — it's a shame that the option isn't included. As it's such a major plus in the Wii original and Wii U co-release, its absence feels rather conspicuous. Aside from that omission, and as suggested already, this title does an admirable job of matching the visual fidelity of the Wii source material; it's certainly one of the best looking titles on the system. The animation remains fluid and smooth most of the time, with very occasional and minor slowdown in some areas where there's extensive foliage and water effects alongside a large monster; it's never too distracting or influential on gameplay. At times the title's origins as a home console release also betray it slightly, with the larger adversaries and crowded environments squeezing onto the handheld's screen and being harder to handle than on the broader space of a TV. We can imagine that the area designs in Monster Hunter 4 will have a little less filling the screen, to avoid such instances overwhelming the senses. An area that does suit the platform unlike its home console brethren is StreetPass sharing, taking the multiplayer exchange of Guild Cards on the go. In addition, it looks set to follow up with the same huge range of free DLC, catering to varying levels to add even more quests as you progress. The promised launch day inclusion of cross-save sharing with the Wii U title also means that, for those investing in both versions, it'll always be possible to seamlessly continue the campaign in Moga Village or Port Tanzia. This 3DS release of Monster Hunter 3 Ultimate is an exciting option for those without a Wii U, allowing hunters to invest countless hours in another adventure to conquer hundreds of quests. It's an excellent interpretation of a home console experience, though with occasional moments where its smaller home isn't entirely optimised; the absence of online play is also a great pity. It's an accomplished effort, though, and a must for fans of the franchise that can't access the new home console version, or those that simply want to always be able to slay an almighty monster when on the move. Hmm, I think the Wii U version is considerably better really. Mannn I wish they'd add online at least as DLC or somethin'. I thought they did a great job with the controls in the demo, and despite the framerate drops it's a really pretty game. I'll pick it up eventually; I already put 180 hours in MH3 so I'm not in a hurry to jump on this without the online component. Interesting review. I personally prefer the idea of having this game on my 3DS and playing it locally with friends though I can understand how some would complain about not being able to play online. My online experience in Monster Hunter Tri was good but I can live without it for now since I have friends that will play this game regularly with me. I will still be most likely getting the Wii U version as well once I get a Wii U because of the save transfer feature. That is a big plus for me. I'm eager to play this game tomorrow! This is the version I'm getting! Good review! Am gonna get this version and when get wii u ill get that one and swap data over . @Thomas Where in the world did you find time to review both?!?! i'm going to buy this version. This is the first time I'm going to play a Monster Hunter game in the series which will hopefully get me into it. It's certainly given me a message to never give up, because when I first started off with the demo I felt helpless fighting Lagombi on easy mode until I got used to the controls and practiced my timing, dodging, using items when it started to limp which made me get hyped for this. I'm still questioning if I'll need a CPP to play this too as the full game could additionally use it, but overall great review Thomas! Good review! I'll be getting this tomorrow after work. I've preordered it also to get my free digital copy of the strategy guide. 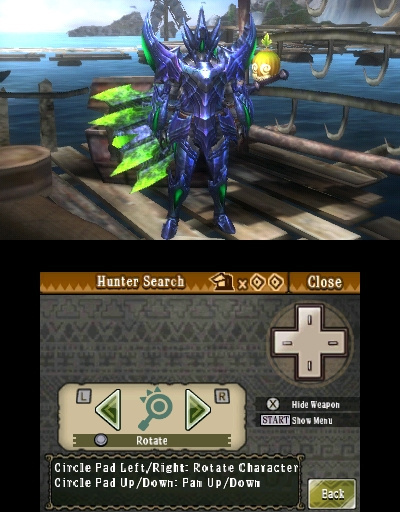 I think i'll need it since this will be my first MH game. Can't wait! I should be getting the Wii U version through the mail on Friday and I'll be downloading the 3DS version at midnight. Awesome review, Thomas! I plan on downloading this at some point in the not too distant future; has anyone heard how many blocks the eShop version requires? This is the first game I've pre-ordered in about 10 years. I'm very excited to pick it up tomorrow!! Great review Thomas. I will probably be playing this version the most except for the times I want to play online. But that probably wont happen till the off tv update comes for the Wii U version. My biggest question is how come games like MK7, Heroes of Ruin, Code of Princess have online mode but not MHU for the 3DS? Was it some sort of marketing ploy so you would have to buy the Wii U version as well? @Ecto-1 Yes. I have heard that it requires over 14000 blocks. It's pretty big. Downloading this tonight at midnight! @squashie - Yes, but it's also considerably more expensive. @Tasuki I'd say no. From what I can tell all of the portable Monster Hunter games lack the online component (seems only the console and PC ones have that option). Apparently, it's due to the fact that the portable games are built around the Japanese demographic (plenty of ways to play locally). Their target audience being people that play more locally gives us this result, a game that has local multiplayer that doesn't really work in the other regions (unless you have a couple of friends that you know will play with you). Well one can hope they'll have taken this into account for Monster Hunter 4. Thank you for the review! I'll be downloading this game tomorrow! I'm not remarkably upset about the lack of online multiplayer personally, but that is likely because I've never played a console version of Monster Hunter, (only PSP) so I'm used to the local-multiplayer-only restrictions. I plan to pick this up tomorrow so I can play with my bro. After nearly 300 hours of playing online I don't think I will miss it too much anyway and would rather play with someone I know I can rely on. @Dpullam @Ecto-1 I've heard not quite that many. More around 13,600 from Go Nintendo. Either way that's around 2 hours for me to dl! @Dpishere I'm getting both versions for me and my bro to play together I've clocked 650+ hours on Tri, but my little (only by 2 years) brother has never played MH, thought I'd introduce him so I could have a local partner and a reason to buy both versions! So which version without online is better, the wii version or the 3DS version? Damn it, Fire Emblem Awakening is still consuming countless hours from me. I prefer playing with friends locally, but that's where online multiplayer comes in, especially since many Monster Hunter games have multiplayer exclusive quests. If the whole game is soloable though, I may pick this up eventually. Demo was good so I'm going to get this. @Tech101 I've played nothing else but MH for two weeks, evenings and not being a great sleeper also helps. I was gutted that the save transfer wasn't available! In terms of online play, as already said in the comments, probably isn't there because of the strong local MP culture in Japan. It feels like a real lost opportunity in the West, I think. In terms of file size it's a little over 14,000 blocks. I'm getting it for both systems tomorrow!I got a good deal from Amazon 80 for both. I will use my wii u for online play and sense I'm a bus driver I have two 30 mins periods at work I can do small quest and gather stuff until I get back home it will be perfect. @ThomasBW84 Your wife and or girlfriend (assuming you have one) really must hate you by now! I'm ready...with imported CPP XL and all! I tried to play the demo. Idk what I was doing. @Tech101 I believe what I said before shows I have neither right now! Well my experience with the demo, they could of made the non-ccp camera control more like KIU. I'm really split two ways with Monster Hunter. I played the 3DS demo and loved it, but at the same time, the controls were difficult, especially underwater and, while I'm not a huge fan of online gaming, the lack of online in Monster Hunter really disappoints me. First world problems, you strike again! I tried out both demos, and I didn't like either of them. I guess Monster Hunter just isn't for me. I really believe that nothing points out the difference between western gaming and Japanese gaming quite like Monster Hunter. Japanese games (Nintendo-developed aside) seem to emphasize mastering technical controls for what western gamers might consider trivial aspects, whether it's a super move in Street Fighter, comboing in just about any Japanese fighter, or just keeping a camera centered on your target in Monster Hunter. Western devs would probably just use a targeting system in a second, but that would then emphasize different skills. Not saying which one is better, but there is a big difference between Japanese and western gaming... for me, this is waaay too Japanese. @pixelman It's pretty obvious the lack of online is just so they make other people (or the same people) buy the Wii U version. I'm glad Capcom decided to do that. @Dodger The 3ds version is far superior if you are not wanting to play the online, simply because in the Wii version if you did not play online you were missing out on most of the monsters, weapons, and armours. In this version you can play the online missions by yourself via local. 4 days left now till i get my hands on my pre ordered version. the 3ds/ wii u cross play is the best damn thing they could do. i`ve played some sessions tri with my friend, but i had to carry my wii and my tv. these days are gone. yeah! I have one copy of each version arriving tomorrow. I'm pretty psyched. I don't get why you would do the Wii U cross play anyways. If you are willing to sit down in front of your TV to play online, why not get and play the Wii U version? It'll probably have more dedicated online anyways. The 3DS version seems to work best as a complementary version to the Wii U game. It's inferior by comparison, but adds a great option for those who want to continue playing on the go (like myself). I actually know quite a few people who will be picking this up so I'll be able to utilise the local multiplayer features too. As far as the controls go, they're pretty terrible... but that's why the Circle Pad Pro exists. Playing without one and saying the game's controls are bad is like playing Tri on the Wii and saying its controls are bad because you're using a Wii Remote + Nunchuck instead of a Classic Controller Pro. @Dodger Monster Hunter is one of those games you can easily rack up hundred of hours playing, so for those who want both versions its nice to not have to play two separate files. a better question would be why not allow cross-play as an option? The controls aren't that bad really except for underwater, but I plan to use cross-play to get around that. Lack of online multiplayer on the other hand I don't get. I get why they left it out of the 3DS version, but then Capcom keeps talking about wanting the series to be more popular outside Japan while they keep tailoring the portable games to what works in Japan only. That right there just baffles me. I don't know whether to get this game or wait for Luigi's Mansion? Although I never defeated the monster, I have to admit that I still had fun with the demo. @Dodger The online part of Tri wasn't easy to take on as a solo adventurer. But if you are wondering if the single player only mode is worth it I would say yes for the most part, though I haven't exactly tried it since it isn't out here yet. Though I think I have heard that you can do quite a bit more in the single player mode than you can in Tri. And like I said you can play all local missions by yourself with Cha-Cha and Kayumba so I think it should be very doable, the option likely wouldn't be there if it wasn't. I'm getting this on 3ds because I love really hard games.I loved Ninja Gaiden on Xbox.I loved Zombi u.I would love Dark Souls if i had an Xbox 360 or PS3.I also loved the demo for this.The buzz you get from beating a hard game is amazing and that is what I'm expecting out of this game. I just got myself a Circle Pad Pro just for this game. It's going to be great, can't wait for my game to arrive! @DSishere Sounds like they made the single player better then. I'll probably get it after Luigi's Mansion then. It sounds fun. Good review! Its cool how you can fully customize the touch screen! There's some sort of app or device available for the 3DS in order to be able to play the 3DS standalone online, right? I may have missed it in the review, and I wish it wasn't necessary to buy it, but the option is there. I don't know why but monster hunter never really caught my attention, I downloaded the 3ds demo 2 weeks ago along with the lords of shadow demo, and I got bored playing monster hunter and instead got addicted with mirror of fate. Playing fire emblem awakening lunatic mode, mirror of fate for the third time, megaman 3 and luigi's mansion 2 coming next week will be keeping me busy for a LOOOOOOOOOOOOOOOOOONG TIME so I don't think I will buy this. @Chunky_Droid Unfortunately, you still need a Wii U to play online with the 3DS version and you can't initiate quests yourself either. @FOURSIDE_BOY If you don't mind, what did you find boring about it? I'm just asking cause if its something to do with the monsters you might still like the full game. 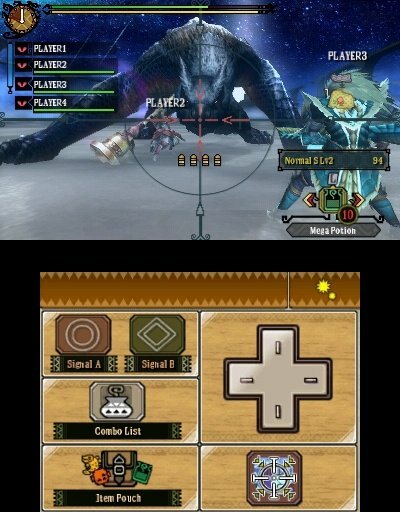 Lagombi and Plesioth aren't the most exciting monsters to face, they should of picked something a little more interesting for a demo. @Zombie_Barioth I really didn't enjoy the demo because I felt the controls kinda weird and also the monsters were kinda dissaponting but if you say there are better monsters I might check it out in the future, when the price drops, because luigi's mansion 2 will be my last purchase this month. I wasn't a fan of the demo, but after seeing you must invest 5-6 hours to learn the ropes; I might give it another shot and pick up a used copy at GameStop when it gets traded in at a store close to me. Lack of online was due to the developers not understanding how 3DS's online infrastructure worked 2 years ago when they were originally finishing development on this game. 3DS and Wii U versions are the exact same. You don't need to head online to get all the armor and weapons in the Wii U version. I rarely touched the online on Monster Hunter Tri so I think this version will be perfect for me. I will be really broke next month since I have been saving up for MH3U(3ds), Fire emblem, Dark moon. This should keep me busy till Pokemon arrives. I liked the controls of the 3DS version actually. For some reason they felt better than the Wii U version to me. But it doesn't matter since I'm probaby not getting the game, just throwing my two cents out there. If you're gonna play offline (like I will), take the Wii U version. You'll love HD and controls... and don't forget that missions can be very long and not very "portable". @pixelman There is the online on the Wii U version. Got mine this morning, but was too drunk to play. Playing it now. Where is the game?! Nintendo seems to do this a lot with eShop games. The first day a game is supposed to be released is the same day the game can never be found. It's almost like Easter egg hunting!.. ...three hours later. Downloading now! I'm so excited since this is my first Monster Hunter experience! I can't wait! First I think "wtf no online on 3DS that's a load of crap" but then I realize that I don't play multiplayer anyways so it doesn't matter XD Is this supposed to be on the eShop today or will I have to wait until the Thursday update? I'm passing on the this version and going to wait for the next one since its supposed to have online play. That doesn't mean I Think the game is going to be bad by any means. In fact I think its going to be a great game. I just prefer my Monster Hunter online with friends. Although I will more than likely pick this up if I ever see a price drop or one of my gaming friends says, "hey lets get Monster Hunter for some local wifi!". I bet the Local wifi will be awesome. I don't own a Wii-U yet and was really hoping this would be the game to get my online fix, fixed It's ok Animal Crossing is coming soon anyway. I really want this game. I have Monster Hunter Tri, but I haven't put it to much use, because strangely, even if it's a great game, I tend to put a LOT more time in portable games, so I'd probably get farther in the 3DS version. does anyone know when the transfer app is coming out for the wiiu to 3Ds save data? I'm going to take a few more whacks at the demo before I make any definite decisions on this. The lack of online isn't much of a deterrence as long as the single player isn't shallow. @Arcamenel The demo seriously gives you a tiny look at the real game and other than getting a glimpse of the battle style does little to show you what else the game has to offer. It's a little like if they released a demo of Final Fantasy 7 that stuck you right into a boss battle and as soon as that battle was over so was the demo. I took advantage of the Amazon preorder discount and saved $20 by purchasing both. This will be my first real experience with the series. I can't wait to hunt at home and on the go. I downloaded this yesterday and have been enjoying it very much. My only real complaint so far is with the font they used for the text, which can be very difficult to read, especially when townspeople are talking. In 3D it can be an absolute mess, depending where the slider is. (At some points it looks like the letters are all on different layers...) I hope this is less of an issue for 3DS XL owners. The rest of the game is lovely, however. @Geonjaha Still, it's worth it for the online play! Wouldn't it be cool if they provided cross platform online play one day (where you're online with both 3ds and Wiiu owners)? That would own! The 3ds version is great. I may however get a circle pad pro to help a little bit. I picked up the Wii U version on launch day but after having played a bit i decided it might be a good idea to have the 3DS version so I could do some grinding while on breaks at work as well and keep my game going. Picked up the 3DS version yesterday and it really is the most impressive looking game for the system that I've seen yet. @MYNISTA Coo, good lookin. I'm about to be on Monster Hunter. I'm just waitin for my CPP XL to come in the mail. Too bad there's no online. @DanielHPoetry I feel ya. I Thoroughly enjoy Mon Hun w my CPP. Don't know if ur into Animal Crossing at all...but New Leaf is where everyone is gonna be at come June 9th! Already got my bread in the E shop for the midnight download. fresh game series! @MYNISTA I like physical copies better but I thought about downloading it for convenience since it's one of those titles that's always good to have with you (thought about doing that for MH too). I've never played an Animal Crossing game but I've been hearing ppl talk about this one since 2011. I really don't know what all the hype is about. I'll download the demo and try it out. @DanielHPoetry Animal Crossing is a fun series. I own all of the ones that were released state side. Fun addicting gameplay.